The system sounds the alarm and flashes lights when forcible entry is detected. The alarm is triggered in the following situations when the alarm is set. • A locked door is unlocked or opened in any way other than by using the entry function (vehicles with smart key system), the wireless remote control door lock function or the mechanical key. (The doors will lock again automatically.) • The hood is opened. • The battery is reconnected. • The side windows are tapped or broken. Close the doors and hood, and lock all doors using the entry function (vehicles with smart key system) or the wireless remote control. The system will be set automatically after 30 seconds. • Unlock the doors using the entry function (vehicles with smart key system) or the wireless remote control. To prevent unexpected triggering of the alarm and vehicle theft, make sure of the following. • Nobody is in the vehicle. • The windows and moon roof are closed before the alarm is set. • No valuables or other personal items are left in the vehicle. • The doors are unlocked using the mechanical key. 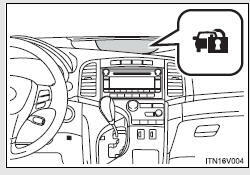 • A person inside the vehicle opens a door or hood. • The battery is recharged or replaced when the vehicle is locked. about one second, an alarm will sound for about 60 seconds and the vehicle lights will flash or come on to deter any person from trying to break into or damage your vehicle. To stop the alarm, press any button on the wireless remote control. Settings (e.g. time elapsed before the alarm is set) can be changed.